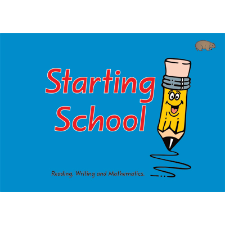 Beginning School ~ Book Two will provide students starting school with a comprehensive introduction to the basic skills of reading, writing and mathematics. Pre-writing activities provide the student with practise in the basic strokes, patterns and movements of handwriting. Pre-reading activities provide the student with essential skills they will need to master reading. Early mathematics activities provide the student with practise in the basic areas of space, measurement and number. Contents and Outcomes pages provide the N.S.W., Queensland, Victorian and National Syllabus references. Instructions are simple and repetitive. Extension activities are provided for the ‘fast finishers’ or more able students. Beginning School ~ Book Two will provide students starting school with a comprehensive introduction to the basic skills of reading, writing and mathematics. Pre-writing activities provide the student with practise in the basic strokes, patterns and movements of handwriting. Pre-reading activities provide the student with essential skills they will need to master reading. Early mathematics activities provide the student with practise in the basic areas of space, measurement and number. Contents and Outcomes pages provide the N.S.W., Queensland, Victorian and National Syllabus references. Instructions are simple and repetitive. Extension activities are provided for the ‘fast finishers’ or more able students.